Thriving at the core of the University of Texas, the US Latina & Latino Oral History Journal has one main goal—to establish the significance of oral history as a way to document, explore, and investigate—as well as highlight the transformative effects of oral history. The journal edited by Maggie Rivas-Rodriguez and Vinicio Sinta (Managing Editor) is a reminder that we must collect and pass on our stories like a burning torch that guides us collectively. The current 2018 Volume, focuses on Best Practices in Research, Teaching, and Service by several renown academics, including Julie Leininger Pycior who traces the development of the field for Mexican American researchers; Maggie Rivas-Rodriguez who addresses an oral history methodology for Multiple Individual Interview Sessions (MIIS); Mary Alice Carnes who outlines the process and findings of interviewing her father, a World War II veteran, before his passing; Rina Benmayor who answers questions regarding her career as an oral historian; and Hannah Gill who speaks about the New Roots/Nuevas Raices Oral History Initiative which documents the arrival of diverse Latino communities in North Carolina. 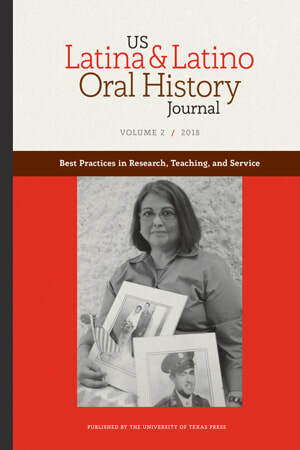 US Latina & Latino Oral History Journal is an enormous tool for those in the fields of History, Latin American Studies, Mexican American Studies, Chicano Studies, and more. It is a shining example of how to revive our Latin American history in the U.S., while connecting with our family and community. The US Latina & Latino Oral History Journal is a publication by the University of Texas Press. Click here to purchase.